For thirty-three years and through three editions, Bass & Stogdill's Handbook of Leadership has been the indispensable bible for every serious student of leadership. Since the third edition came out in 1990, the field of leadership has expanded by an order of magnitude. This completely revised and updated fourth edition reflects the growth and changes in the study of leadership over the past seventeen years, with new chapters on transformational leadership, ethics, presidential leadership, and executive leadership. Throughout the Handbook, the contributions from cognitive social psychology and the social, political, communications, and administrative sciences have been expanded. As in the third edition, Bernard Bass begins with a consideration of the definitions and concepts used, and a brief review of some of the betterknown theories. Professor Bass then focuses on the personal traits, tendencies, attributes, and values of leaders and the knowledge, intellectual competence, and technical skills required for leadership. Next he looks at leaders' socioemotional talents and interpersonal competencies, and the differences in these characteristics in leaders who are imbued with ideologies, especially authoritarianism, Machiavellianism, and self-aggrandizement. A fuller examination of the values, needs, and satisfactions of leaders follows, and singled out for special attention are competitiveness and the preferences for taking risks. In his chapters on personal characteristics, Bass examines the esteem that others generally accord to leaders as a consequence of the leaders' personalities. The many theoretical and research developments about charisma over the past thirty years are crucial and are explored here in depth. 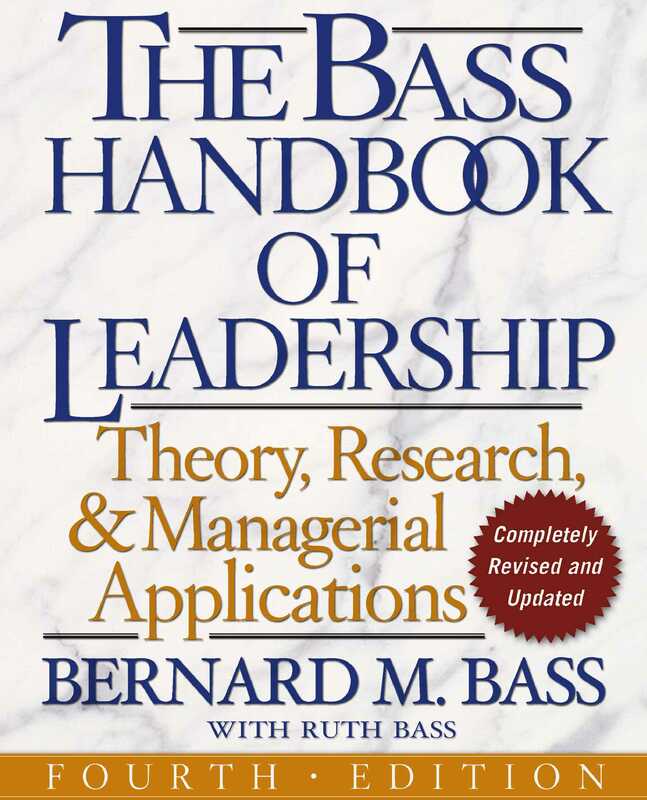 Bass has continued to develop his theory of transformational leadership -- the paradigm of the last twenty years -- and he details how it makes possible the inclusion of a much wider range of phenomena than when theory and modeling are limited to reinforcement strategies. He also details the new incarnations of transformational leadership since the last edition. Bass has greatly expanded his consideration of women and racial minorities, both of whom are increasingly taking on leadership roles. A glossary is included to assist specialists in a particular academic discipline who may be unfamiliar with terms used in other fields. Business professors and students, executives in every industry, and politicians at all levels have relied for years on the time-honored guidance and insight afforded by the Handbook. Dr. Bernard M. Bass was Distinguished Professor Emeritus in the School of Management at Binghamton University and director of the Center for Leadership studies. Since 1946, he has published more than four hundred journal articles and twenty-six books concentrating on leadership, behavior, and international management. Dr. Bass has consulted and conducted training for many of the Fortune 500 firms and conducted workshops in more than forty countries. He was founding editor of The Leadership Quarterly.